I read a press release this morning that I thought would be interesting to share. Below is an excerpt. In January 2009, Barry Leonard was a passenger on USAirways Flight 1549, involved in an incident that became known as the Miracle on the Hudson. The incident made Leonard take stock in his life and reevaluate his bucket list, which now includes an August 2013 climb of Mt. Kilimanjaro with his son Matthew and two good friends, Richard and Matthew Gershen, another father-son team. 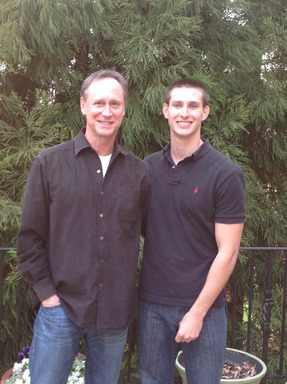 Barry Leonard and his son Matthew. "After the plane crash, I better understood the importance of time, but also the importance of doing things today and not waiting until tomorrow," said Leonard, a Charlotte resident who is president/CEO of home textiles company Welspun USA. "I always thought these things would be what I will do 'someday' but that has all changed." Leonard's climb will help raise funds for the Kilimanjaro Education Foundation, a nonprofit volunteer organization with a mission to provide African children the same educational opportunities as children in developed countries. Funds raised from his climb will help build school facilities and also furnish library books to a new library an hour outside of Arusha. With an August climb scheduled, Leonard has begun training in earnest, riding a stationary bike and running on a treadmill. He has also started hiking in the local hills of North Carolina to be followed by hiking Mount Mitchell, which is the tallest mountain in the U.S. east of the Mississippi River. "There are things you want to do together in life with a son and this is one of them," he said. "Since the plane crash, I've gone through a lot of stages. I know a lot of people say 'it was four years ago, that should be behind you,' but I'm in a search for spirituality stage. For me that is a huge part of what this climb is all about." As you probably know, the plane from US Airways Flight 1549 is now the signature exhibit at Carolinas Aviation Museum. I chronicled its arrival to the Charlotte museum back in June 2011, when I met several of the survivors who attended the homecoming reception. A year later, the once-little-known museum completed a renovation to showcase the Miracle on the Hudson exhibit, in a manner befitting of its notoriety. Then in February, Carolinas Aviation Museum received the coveted Smithsonian Institution affiliation, a designation that fewer than 180 of the country's 18,000 museums have.